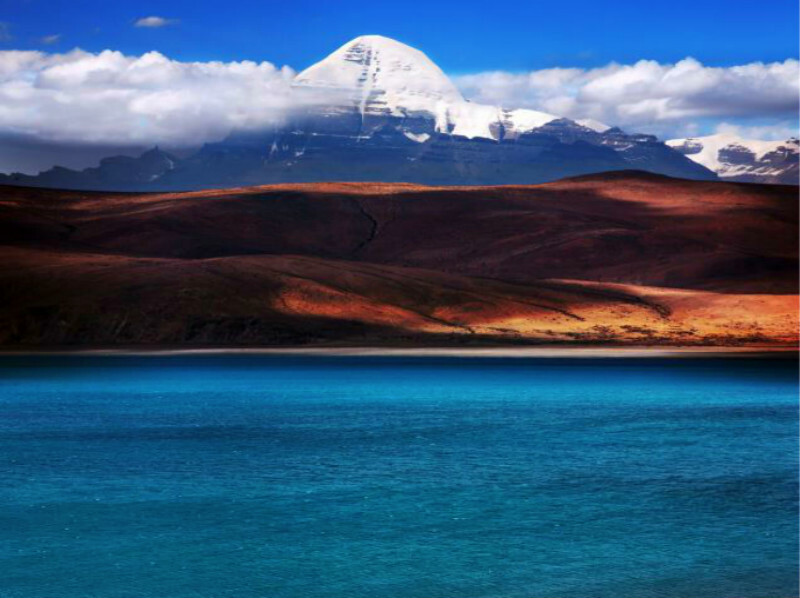 Manasarovar Lake：The fresh water lake is 4,588 meters high above sea level and covers an area of 330 square kilometers. The depth of the lake is 81.8 meters. The lake is situated between two snow-covered mountain ranges is extremely beautiful. It is an important part for the Tibetan pilgrims to orbit and take a bath in the lake.The small monastery Chiu Gompa standing on rock, offers a splendid view over the lake. Mt. Everest:Mount Qomolangma, also called Mt. Everest, is the highest peak in the world. Its Tibetan meaning of Goddess the Third adds more mysterious color and magic power to the subject. As a result, it has intrigued all kinds of people since it was first discovered. Pilgrims trek long distances to present a pious worship, climbing enthusiasts run great risks to challenge its high altitude and the common tourists also yearn for a reverent look at this holy peak. Detailed Itinerary: On arrival you will arrive at the airport and be greeted by your tour guide. Then you will drive to hotel and have a rest at your hotel. 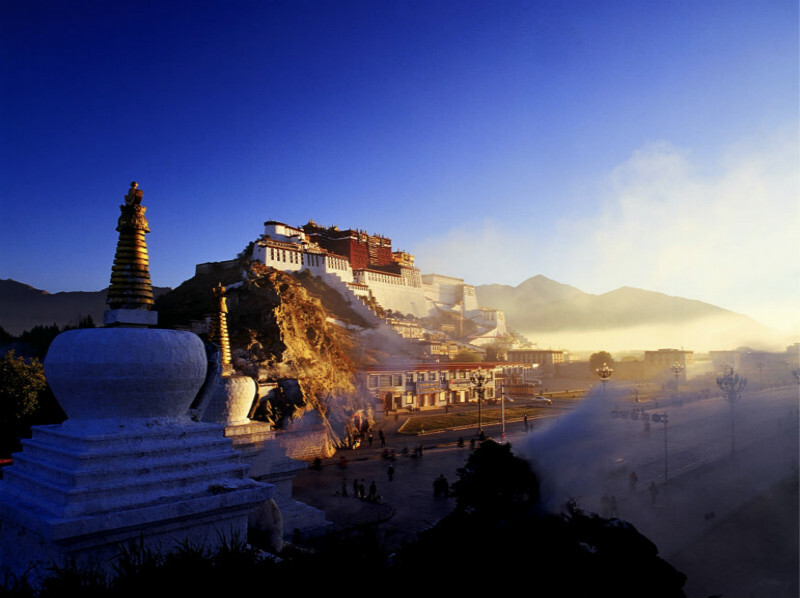 - The Potala Palace: The Potala Palace, which is now on the list of Chinese national key protected cultural relics, is the most valuable storehouse in Tibet. 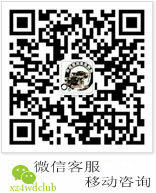 It is a huge treasure house for materials and articles of Tibetan history, religion, culture and arts. The Palace is widely known for the precious sculptures, murals, scripture, Buddha figures, murals, antiques, and religious jewelry treasured up, they are of great cultural and artistic value. 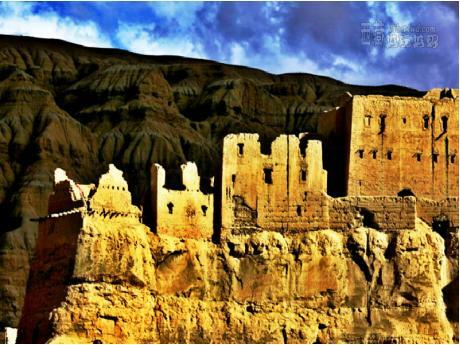 In 1994, the Potala Palace was declared the United Nations World Cultural Heritage site.Perched upon the Marpo Ri Hill, 130 meters above the Lhasa valley, it is the greatest monumental structure in Tibet. - The Jokhang Temple: Constructed in the 7th century AD to house the statues of Buddha that princesses Bhrikuti from Nepal and Wen Cheng from Tang Dynasty China brought as gifts for their future husband, King Songtsan Gampo. The temple has been enlarged many times over the centuries and now also houses statues of King Songtsan Gambo and his two famous foreign brides. However, the original statue of Jowo Sakyamuni Buddha that Princess Wen Cheng brought from Chang’an over 1300 years ago is definitely it’s most sacred and famous possession, and is perhaps the most venerated religious artifact in all of Tibet. The temple, a splendid four-floor building facing west under a gilded rooftop, is located on Barkhor Square in the center of the old section of Lhasa. - Barkhor Street: The Barkhor is the oldest street in Lhasa as well as the center of old Lhasa and remains very traditional. It is a place where Tibetan culture, economy, religion and arts are assembled. - Yomdrok Lake: It lies within the boundary of Nankartse county, on the north bank of the Yarlung Tsangpo River, Lhokha Prefecture, surrounded by mountains. Beautiful Holy lake which everybody is looking forward to. - Tashilunpo Monastery: Painted in red and white, the buildings in the kloster stand closely together in terraced rows, offering a grand and majestic view. Tashilunpo Kloster represents the Tibetan super architecture art in the Last Tibetan spirit. The Kloster attracts thousands of Buddhists and tourists from domestic and abroad to travel and worship every year. .
- Rongphu Monastery: Rongphu Monastery is 90 kilometers away from the Tingri County seat and is 5,800 meters above sea level, the highest of its kind in the world. Annually it holds three-day sorcerers activities on the 15th of the fourth month and the Ghost-Beating Festival on the 29th of the 11th month of the Tibetan calendar. - Everest Base Camp: Mt. 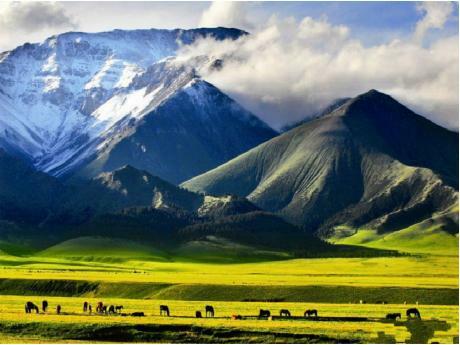 Everest, called Mount Qumulangma in Tibetan Language, is the highest peak of the Earth and probably the most coveted mountain in adventurous travelers’ eyes. Journey to Mt. Everest Base Camp is a both physical as well as psychological challenge to you, but it will definitely reward you with the most unparalleled views – a panorama of Himalayan peaks - and never-forgotten beautiful memories. －Manasarovar Lake：The fresh water lake is 4,588 meters high above sea level and covers an area of 330 square kilometers. The depth of the lake is 81.8 meters. The lake is situated between two snow-covered mountain ranges is extremely beautiful. It is an important part for the Tibetan pilgrims to orbit and take a bath in the lake.The small monastery Chiu Gompa standing on rock, offers a splendid view over the lake. 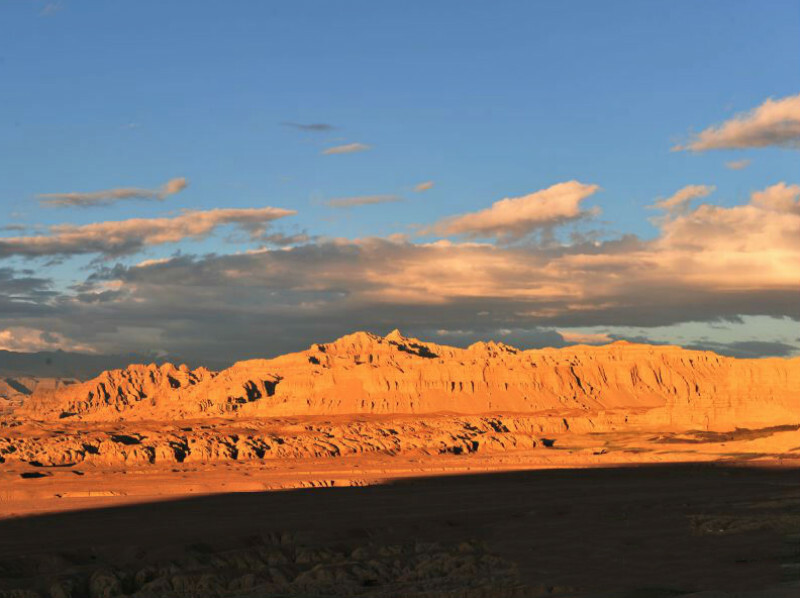 －Kailash： Darchen (4800 m), which is 6 km to the north of the main street. 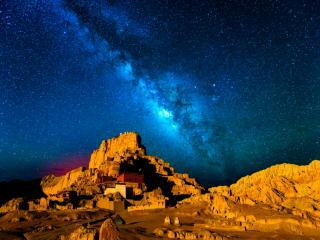 Here we prepare for the Kailash orbiting. The Kailash is the holy place for four religions: the Hinduism, Buddhism, Jains and Bon. It should be the holiest place in the world.